Losing just one tooth may not seem like a big deal. In fact, many Brookfield dental patients choose to forego replacing just one tooth if they can’t see it in their smiles. Unfortunately, even one lost tooth can lead to changes in the structure and function of your bite. Without stimulus from tooth roots, the supportive bone and gum tissue begins to diminish, allowing surrounding teeth to shift. As teeth shift to fill the gaps in your smile, excess pressure is placed on teeth on either side of the gap in your smile, leading to dental wear, chips, cracks, and increased risk for tooth decay. Eventually, this can lead to additional tooth loss. At Elmbrook Family Dental, we are committed to offering a range of dentistry options to resolve any oral health concerns and keep patients smiling. If you’ve lost a single tooth or a full row of teeth, we can deliver tooth replacement solutions to ensure your smile remains healthy and functional. If you’re ready to learn more, call our dental office in Brookfield to schedule a tooth replacement consultation with our team. We’ll review your treatment options and help you develop the best restoration plan for your smile. Keep reading to learn more about single tooth replacements available in our Brookfield dental office. Following the loss of just one tooth, there are two main restoration options available – traditional fixed bridges and implant supported dental crowns. A traditional fixed bridge is crafted using two dental crowns fused to both sides of a replacement tooth. Then, the dental crowns are attached to healthy teeth on either side of the replacement tooth, bridging the gap in your smile. While fixed bridges are permanently affixed and natural looking and functioning, they fail to replace the root structures of missing teeth. Implant supported dental crowns offer complete restoration of both the root and visible portion of the tooth. 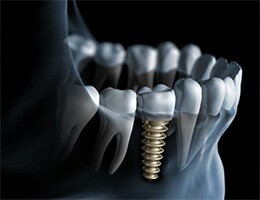 The dental implant post replaces the tooth roots. Then, a custom crown is affixed to the implant post. Single tooth implants are the closest to natural teeth that you can get with a replacement option. The surgically positioned dental implant post fuses with the bone and gum tissue over the course of several months, providing stimulus for supportive structures and support for the replacement tooth. In short, they offer a seamless restoration option. 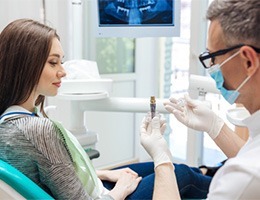 Improved oral health – with the stimulus from dental implant posts, you can rely on an implant supported dental crown to ensure you maintain healthy gum tissue volume and jawbone density, which means your smile will be healthy and functional for years to come. Long lasting – after placement, your implant supported dental crown will remain in place and functional for two decades or longer in many cases. A fixed bridge will need to be replaced at least once a decade to maintain proper function. No hassle – you won’t experience any changes in the way your smile functions or the way you care for your teeth. You can simply brush and floss as usual, eat all of your favorite foods, and smile with complete confidence.